The ultimate kitchen equipment list changes with the era because technology and trends impact how we eat and, of course, how we cook. Put simply, today is a glorious time for cooking nerds because the equipment and tools available can boggle the mind. 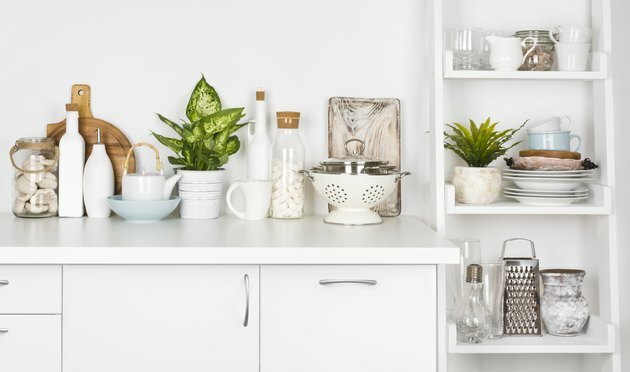 When compiling lists of kitchen supplies, there are essentials and must-haves for every kitchen, convenience items that make common tasks easier and then indulgence items – tools that are unnecessary but are wonderful to have. Pots and pans, spoons and spatulas and flatware and eating dishes are all staples no kitchen can be without. Investing in quality pots and pans is the smartest thing you can do with a new kitchen. A frying pan or skillet is the no-brainer workhorse in every kitchen, but it gets bonus points if it has a lid. Stock pots and Dutch ovens get heavy use for everything from making soups to boiling pasta. Sauce pots of varying volumes are useful for everything from making a peppercorn steak sauce to boiling carrots for a Sunday roast dinner. Casserole dishes make one-pot cooking meals a breeze. Cake pans, bread tins and cookie sheets are must-haves for any baking fan. Mixing bowls and salad bowls will be necessary for everything from communal salads to movie-night popcorn. A potato masher makes a quick side dish, but a potato peeler makes prep easy. Then there are the wooden spoons that no great ragu can be cooked without, the colander for draining noodles, a cheese grater to finish the pasta, a ladle to dole out the sauce and tongs for serving up the noodles or turning foods cooking at high temperatures. A kitchen without a spatula is doomed to no fried eggs, no pancakes and no hamburgers. Of course, knives are critical to a kitchen and are worth an investment, but get a sharpening steel while you're at it to keep them sharp for years to come. Most of these items are simply must-haves, but a variety of options means you should consider wisely before choosing what's ideal for you. Blender: Today's blender comes in all manner of sizes, shapes and functions. At its heart, it's a whirligig with sharp blades intended to pulse, blend or chop its contents. One of the most common blender jobs is juicing and beverage prep, for which high-power blenders of over 600 watts are best. Many cooks consider immersion blenders to be more versatile, as the "boat motor" style means it can be used to easily puree a pot of soup too. Toaster: Making toast has come a long way since the bagel trend of the '90s opened the door to wide-slot toasters. Wide slots are often essential for the bread fan, thanks to the preponderance of artisanal bakeries and the rise in popularity of homemade breadmaking and breadmakers. You can go big for a taskmaster toaster oven, which come with a wide variety of functions including air frying for some of the best roast potatoes you've ever eaten. Toaster ovens can serve as an extra oven for entertaining or can save on energy when you don't need your full-sized appliance. Stand Mixer: This mixer has a bowl attached and is considered essential for baking fanatics. Some brands have add-on options like meat grinders for making your own hamburger or sausages and electric pasta makers when you crave noodles. Microwave: Considered by many to be essential, it's actually not, as most functions are accomplished with stoves and ovens. It all comes down to how busy you are and how many people might need to quickly heat a meal. That said, it can be a lifesaver for hectic families. Slow cooker/pressure cooker: Once a single-function item, a new generation of combo appliances can do everything from making perfect steamed rice to turning out a pork pot roast in under 40 minutes. Why get one appliance when you can get seven appliances in one? The Instant Pot is just one of a number of such appliances gaining notoriety in busy family kitchens. Can Opener: Today, there are safety can openers designed to eliminate the sharp edges that strike fear in the hearts of parents. Measuring Cups and Spoons: Get both metric and imperial measurements so you're not flummoxed by recipes from the parts of the world that use the metric system. Always get both wet and dry measuring cups since the quantities are not the same. Cutting Board: Science has found that plastic cutting boards are actually not as hygienic as they thought, and the classic wooden chopping board is best. Get a large, thick board with curved wells around the edges to trap liquid from spilling onto counters or floors. For those who love to cook, there are a variety of tools that the casual cook might not consider essential, and many of these make that list. Cast-Iron Cookery: From Dutch ovens – which make incredible braises like pulled pork and coq au vin – to 12-inch skillets, cast iron retains and converts heat, second only to copper. Plus, it's nearly indestructible, can be restored after decades of rust and it supplements iron in your diet. A cast-iron frying pan gets a great sear on your expensive steaks, and a griddle is tops for all kinds of cooking. Learn to season your cast iron for best results. Rolling Pin: If you like baking or making breads, rolling pins are essential. For the pie baker or fan of flaky pastry, marble or metal is the way to go, as it keeps the butter from getting warm and overworked, killing the flake. If you're into things like phyllo and traditional flatbreads and pasta making by hand, a long, thin, flat wooden rod is the go-to tool. Whisk: Ideal for scrambling eggs, blending salad dressings and beating egg whites, a whisk is essential for those who'd like to try their hand with sauces like Hollandaise for Benedicts and roux-based cookery like gumbo. Pro tip: Silicone-coated tines will save your nonstick pans. Slotted Spoon: This tool is the one you'll regret not having if you're making poached eggs, braised meats and other foods that involve removing the ingredient from a pot of liquid without bringing the liquid with it. Meat Thermometer: An instant-read digital meat thermometer will mean never having an undercooked Thanksgiving turkey again. When you're investing money in quality cuts of meat, this is how to make sure you don't waste that dough. It's also handy for testing doneness in bread, getting milk to the right temperature for making ricotta and even for making candy and fudge. Salad Spinner: Getting greens nice and dry means salad dressing sticking to the leaves. Salad spinners are one of those tools that didn't exist a few decades ago but are now essential for those who enjoy healthy meals. While a plate of meatloaf and potatoes still makes the heart sing, it's a bold new world out there with curries and tacos and all kinds of other delicious foods from around the world. Having the tools for making your favorite far-flung meals can make all the difference in getting an authentic feast on the table. Tortilla Press: A tortilla press means getting an authentic corn or flour tortilla made more quickly. Spend more to get the heavy-gauge, cast-iron models because these tools take a beating and break easily with lesser metals. Pasta Maker: Available for as little as $35 sometimes, hand-cranked pasta makers attach to tables or counters with a vice grip and churn out thin pasta dough. The best models have six to 10 numbers on the dial corresponding to different thickness selections, as pasta should be fed through several times to come out thin. Mortar and Pestle: These crushing tools are available in a few variations, as they're common in Italy, Thailand, Mexico and South America. Beware of versions with a smooth finish in the bowl, as the coarse surface is what helps you to grind the spices, herbs and other ingredients to a pulp. These are fantastic for fans of Thai curries, Italian pestos and Mexico's wonderful guacamoles. Terracotta Roasters: Popular in France, Mexico and other regions, terracotta roasters come in a variety of sizes. Some are designed for garlic and some for vegetable sides, and others are 3- to 7-quart ones meant to cook chickens and other meat roasts. The terracotta is soaked in water and creates a moist, basted meal. A terracotta chicken with vegetables and a splash of wine comes out with a half pot full of delicious juices that are ideal for sopping up with crusty bread. Pizza Stone: More versatile than its name suggests, the pizza stone is designed to mimic the hot floor of a wood-fired oven and is ideal for making flatbreads of any style, from naan to focaccia. Wok: You can, in theory, make a stir fry in a frying pan, but a proper wok is designed to make it easy to continually be stirring and moving the ingredients around. It's also designed to get the most out of a gas-flame stove, thanks to the tapered sides. Tajine: This conical covered top is designed to be a self-basting cooking pot so that a little liquid goes a long way in creating moist, flavorful cooking common in the Middle East and North Africa. Tajines can be used in the oven or on stove tops and may require that you season the pot before first use. Today's coffee lover can choose from all manner of coffee equipment, and there's no reason you can't have several kinds of brewing options to suit your mood. Of course, you'll need a tea kettle for boiling water. French Press: While the Bodum-style French press is an iconic option, many devotees have suffered from breaking the glass carafe. Today, double-walled aluminum, thermal French presses are indestructible and a great investment. Plus, it'll keep coffee warm until you polish off your first cup. Pod Machines: This is the most convenient coffee machine to make on-demand, espresso-quality drinks. Some come with enviromentally friendly refillable pods that are also far easier on the wallet since the pods are up to 10 times more expensive than buying coffee grinds yourself. Moka Pot: A mainstay in the Italian kitchen for much of the past century, the Bialetti-invented moka pot is a strong espresso-style coffee ritual that many people fall in love with when traveling. Coffee Grinder: Fresh beans are the best, but to get a true cafe-quality grind, get a grinder with preset grinding for everything from Turkish- to French-press grinds. Consider burr grinders with ceramic blades that prevent super heating the beans so they don't taste burnt. Never forget the classic drip coffee brewers, which can have programmable settings to be cued to brew while you're still in bed. Now that's a good morning!